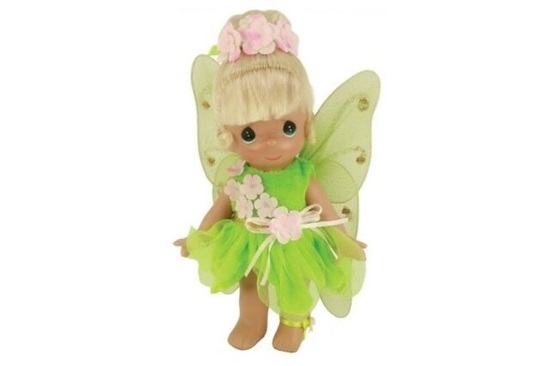 Every fairy tale deserves a precocious little fairy like Tinkerbelle! Sje is sure to keep Peter and the Lost Boys in line wearing her velour green dress with the matching green overlay. A iridescent floral sash runs across her chest and fairy wings will help her keep ahead of the boys. Her blonde rooted hair is swept atop her head in a bun circled by a iridescant floral headband. She has painted green tear drop eyes and a gracious painted smile. She is 9 inches tall and is jointed at her neck, arms, and legs. She is perfect for ages 14 and up.